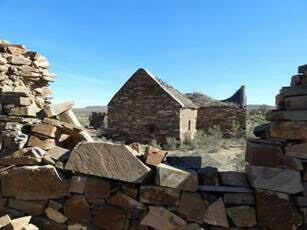 Nigel Amschwand will speak on the history of the farm in the Sutherland district which the Vernacs surveyed last year. The farm Elandsberg is located on the Riet River and was granted to Andries van der Walt in January 1766. The T-shaped stone-built farmhouse still survives although in poor condition, along with several outbuildings and a stone-walled kraal. The full report on Elandsberg has been published in the latest VASSA Journal. Our speaker, Nigel Amschwand, is a long-standing member of the Vernacs and served on the committee as treasurer for a number of years. An engineer by training, Nigel has a great enthusiasm for our vernacular past, with an interest in the old routes as well as the histories of the families that populated the often remote reaches of the Cape hinterland. He has also organised many measuring up trips with an intrepid group of members, including among others, the late Guido Lugtenburg who recorded the surveys in beautiful detail. Their survey of Matjesfontein farm has been published in an earlier VASSA journal. Nigel has published in the VASSA Journal on several occasions and is also the author of the book ‘A short history of the Onder-Bokkeveld’.